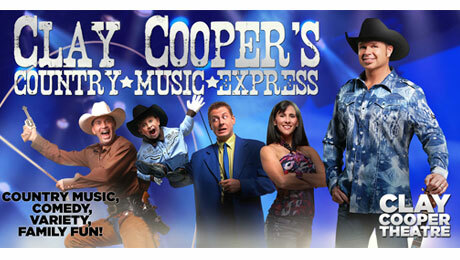 As one of the most popular Branson shows, Clay Cooper’s Country Express is a variety show that provides audiences high energy performances of singing, dancing, trick-roping, comedy, and much more. Clay Cooper’s Country Express has something for everyone featuring 24 entertainers, great visual effects and a variety of old and new country music, current hits, rock, gospel, and patriotic. Headlined by the incomparable Branson veteran artist Clay Cooper, this is a show that you don’t want to miss. Awarded Entertainer of the Year 2015 and Show of the Year 2017 by the Terry Awards, Clay Cooper has proven to be an incredible entertainer. Clay Cooper has started to perform for Branson audience at the age of 16. He originally came to Branson to perform with a kid’s band known as the Texas Goldminors. Clay just loved singing and playing bass, and delighted meeting new people. He has performed in several Branson shows and now celebrates his 31st season in this entertainment capital. Clay’s love for country music, clean comedy, and human interaction, has made him a star on the Branson entertainment circuit and a favorite personality among audiences. This veteran entertainer always hangs out after every show, greeting the audience and meeting new fans. This show brings songs that range from George Jones to the Doobie Brothers to Bruno Mars and to Hunter Hayes. With this kind of variety, you’re sure to hear something you certainly love. And it wouldn’t be a perfect Branson show without laughter. You’re sure to appreciate Matt Gumm as he delivers the funny stuff big-time – and if he can’t make you laugh, your funny bone is broken. Don’t miss the fantastic dancing directed by Mrs. Clay Cooper, Tina; her dancers are some of the best Branson has to offer. To make it the perfect family show, the young Coopers, Cold and Caden, perform also, along with Oklahoma’s little sweetheart, Ezrah Noelle. This show is not complete without a real live seven-piece band. This is an all-ages production show at Clay Cooper Theatre that the whole family will love as the music of the performing artists will have you stomping your feet, laughing hysterically and singing along. The show’s unbelievable talent, hysterical comedy, and down-home personality bring audiences back time and time again. At Clay Cooper Theatre, you’re always guaranteed a great time. Hosting four shows and several special events throughout the year, Clay and his incredible staff go the extra mile to provide you ultimate family fun. The theatre was formerly owned and operated by the Osmond Family and taken over by Clay Cooper in January 2010. Since that time, an additional 7,000 square feet was added for additional dressing rooms, rehearsal hall, kid’s area, technical and costume storage, a dance hall, and the lobby was expanded. A state-of-the-art sound and lighting as well as new video screens and cameras were also added. If you want to watch one of the best Branson shows, don’t miss the Clay Cooper’s Country Express, it’s the perfect show for the whole family.